Every day, thousands of Chicagoland parents put their children on the bus for school, assured that a yellow school bus is one of the safest places those children can be. But images from the city’s own cameras, show thousands of examples of school buses running red lights, or far exceeding the speed limit. And an investigation by NBC5 Investigates calls into question the extent to which the Chicago Public Schools are holding those companies accountable. 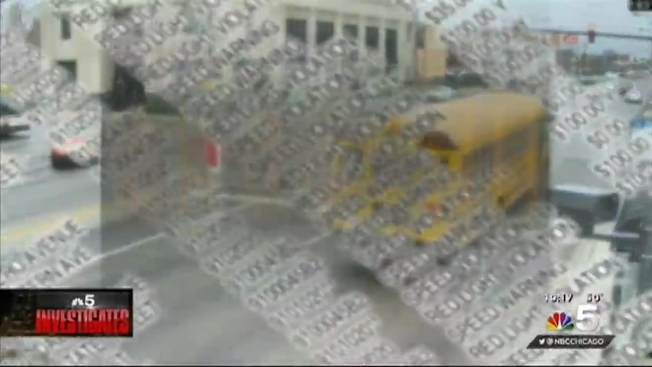 Documents obtained by NBC5 show some 2300 occasions over the last 20 months, where school buses were caught on camera, speeding or running red lights. And there is video of every single violation. Among the top violators, 70 individual buses racked up five or more citations. Six were caught speeding or running red lights more than ten times each. The grand champion on the list was Chicago’s R&D bus company. Twelve of R&D’s buses were caught at least five times. One was caught speeding 23 times in just six months. Another, was photographed speeding or running red lights 15 times in only four months. But R&D is certainly not the only violator. Chicago’s AM bus company, headquartered in the Roseland neighborhood, had 13 buses on the list which were caught speeding and running red lights more than five times each. AM’s website says that it has “more than one hundred school buses”, which means that about one in every ten of its school buses has been speeding and running red lights, not just once, but time after time. Chicago Public Schools refused requests to make anyone from Student Transportation available to discuss the red light and speed camera findings. In a statement, CPS insisted that student safety is the school system’s highest priority. Parents with safety concerns were encouraged to report them to CPS headquarters. While the 2300 violations were documented by the city’s own cameras, CPS spokesman Andrew Mason argued that only 1500 involved routes to and from Chicago Public Schools, and that only 1000 of those actually resulted in a fine. In the last two years, he said, the school system has terminated two vendors which did not meet standards, and two others were not renewed at the end of their contracts. 61 bus drivers, Mason said, had been banned for safety and quality issues since 2010. If CPS doesn’t want to talk about safety issues, they certainly are aware. Board of Education documents obtained by NBC5 show a litany of complaints from parents. And 224 of those complaints in the last 20 months concerned routes driven by R&D and AM. Among those reports, one motorist complained an R&D bus was “in the wrong lane and could have caused a head-on accident.” Another said an AM bus was driving, “like a bat out of hell”. An AM driver was reported in the complaints six different times, for driving recklessly, cutting off drivers, and talking on his phone. But there was no record that any action was taken against that driver, beyond a single “verbal warning”. And in more than three quarters of the dangerous driving reports involving those two companies alone, the Board of Education’s own notes indicate no action taken at all.